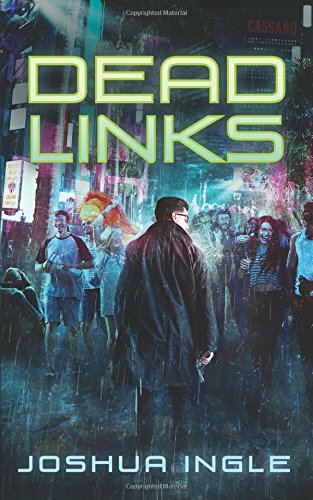 “Dead Links” by Joshua Ingle is a dual-perspective sci-fi thriller revolving around the murder of Emilio Cassano, the man behind a global corporate empire. With no witnesses to the murder and only a series of increasingly perplexing clues to guide him, private investigator Guy Rosen finds himself just as deep in the dark as the rest of the mysterious Cassano family. Joshua Ingle brings readers twenty years into the future on the gritty streets of L. A., where technology has been integrated into nearly all areas of everyday life. Ingle uses this technology-dependent world to explore the dangers of addiction and its effect on society. Woven into an engaging mystery, this important message is clearly stated and could be applied to anything used in excess. The plot is full of twists and turns. A complicated family dynamic adds to the mystery of Cassano’s murder, and the reader has no idea who they should trust. Everyone has something to hide and each new piece of information fuels the tension in an already strange situation. Readers follow two narrators in two separate timelines. Guy Rosen takes them through the present story, and depressed former millionaire Alan Kornick guides them through an earlier one. Alternating between first-person (for Guy) and third-person (for Alan) adds an interesting flavor to the novel. I do have one criticism of this technique; it was not made clear that these two narrations were taking place during different time periods until the end. I was left frustrated upon the revelation. That made it seem purely like a plot device and took away from both POV’s in my opinion. I found the overall pace of “Dead Links” a bit strange. The first half of the novel is slow and provides most of the information readers need about this futuristic L.A., and the second half, where most of the action takes place, is much faster. The shift itself is sudden but handled effectively. I wasn’t a fan of some of the dialogue. There are large sections of it that read awkwardly, because they are packed with information solely for the readers’ benefit. These passages are partly responsible for the slow pacing in the beginning of the novel. “Dead Links” by Joshua Ingle is a sci-fi novel different from any others I’ve read before. The author was a little heavy-handed with his message for my taste, but I did enjoy seeing the topic of addiction discussed in this setting. It’s something I wish more speculative fiction did. This novel brings a message of modern danger from the future in a way that is engaging and keeps readers interested! It’s a great way for any new reader to ease into the sci-fi genre.